Dropnoise is a pioneer supplier of products and services for tackling noise nuisance in neighbourhoods. 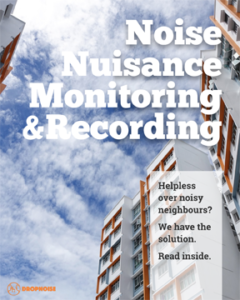 Based in Singapore, we perform noise nuisance recordings for clients and supply a compact and effective range of products Dropnoise is a pioneer supplier of products and services for tackling noise nuisance in neighbourhoods. Based in Singapore, we perform noise nuisance recordings for clients and supply a compact and effective range of products that serve to protect the well-being of you and your family. Contact us for a non-obligatory consultation or visit our online store today. We help to measure and record noise from your neighbour so that you may use it to indicate a genuine nuisance does exists. Living with noise: How much is too much? Living with high ambient noise may lead to noise-induced hearing loss​, according to World Health Organisation. We follow an expert to measure noise pollution levels at local residences near an expressway and MRT track. Singapore is a fairly noisy city. Ambient noise in Singapore measured in the quiet of the night is greater than 55 decibels as compared with 40 to 50 decibels in Europe. Singapore is a small and densely populated city-state with an average of over 7,000 residents in each square kilometre of land. Due to the land constraint, there is a limit on the setback distances and land buffers that can be provided to keep noise sources such as road and rail traffic away from residential areas. As of June 2013, 82% of resident population lives in Housing and Development Board (HDB) flats. As the number of Singapore residents increase, more and more HDB flats and condomiums will be built and possibly at a greater approximity to one another. There are currently about 70,000 complaints made each year to various government agencies about noise. As the city-state gets densers and with greater cultural diversity, it is set to get noiser and chances of encountering a noise neighbour will inevitably be higher as well. Read all about noise here. Quarrelings amongst family members are a common sight. It can involve lots of shoutings, banging of doors, throwing of stuffs around. It usually occurs on a random basis and can happen in the middle of the night and awaken you. Your next-door neighbour (or worse your upper floor neighbour) bought a new condo and decided to rent out their flat. You consistently get new neighbours (i.e. the tenants) moving in and out on a regularly basis (depending on the lease). To make it worse, a unit of flat is almost always rented out to multiple tenants at the same time. Your neighbour has one or more young kids who like to run around or spread their toys on the uncarpeted floor. The excessive noise can also be from the screaming, shouting and crying by the kids. Your neighbour decided to convert their home into office. While HDB permits the use of home-office, only selected businesses are allowed. In addition, the use of the flat should not create a nusiance to the neighbourhood. However, there may be cases of flat owners who use their flat for low volume production or run their music business in the unit. Your neighbour keeps a dog and it barks continuously. Your neighbour does not attend to the dog and keep it from barking. Your neighbours like to talk loudly, turn up the bass-heavy stereo system and TV, perform DIY home fixing and repairs, stamp the floor, host parties/gatherings, play mahjong throughout the night, play musical instruments and more. Prolong exposure to noisy environment can result in detrimental effects to your health and quality of life. It can cause hypertension, annoyance and sleep disturbance. It can also result in family disharmony. Changes in the immune system and birth defects have also been attributed to noise exposure. Research overseas has found that a constant noise level of more than 80 decibels has been associated with increased risk of permanent hearing loss, 65 decibels with hypertension and heart disease, 55 decibels with significantly disrupted sleep and 40 decibels with reduced concentration. Generally, sound of up to 45 dB is considered the limit indoors as per the United States Environmental Protection Agency (USEPA). Above 45 dB (a little shy of the amount of sound in a quiet office), we tend to get a little irritated. Read about the facts on hearing loss that your probably do not know here. To provide a convincing case of being a victim of a noisy neighbour, you will need to understand what scenario qualify you for making a justifiable complain. Find out more about various noise regulations and legislations in Singapore here. The National Environment Agency (NEA) revealed that up to 95% of more than 16,000 complains about noise level made in 2014 is unsubstantiated. According to NEA, most of the noise meter applications on mobile phones are inaccurate. Measurements of noise levels for law enforcement purposes shall be carried out with a noise meter that complies with the standards specified in the International Electrotechnical Commission Publication 651 (Type 1) and Publication 804 (Type 1), or any other comparable standards. Otherwise, noise meter of Type 2 will be suffice. Read more here. Talk to the neighbours. Highlight what you have been experiencing and explore a solution with the neighbors. If you have any proof of the disturbance created by the neighbours, show it to them. They sometimes aren’t aware of the noises they created. If the transgression is minor (e.g. air-conditioning unit is too noisy), contact your HDB branch office. Resort to mediation. Mediation can be done at a Community Mediation Centre, which has a panel of trained volunteer mediators. The mediator will strive to identify the dispute issue and come up with a win-win solution. You can record video, provide photographs and/or noise recordings to justify your case. Register your case online or call hotline at 1800-2255-529. If mediation failed, file your case with the Community Disputes Resolution Tribunal (CDRTs) at The State Courts located at 1 Havelock Square, Singapore 059724. The CDRTs handle unreasonable interferences with the enjoyment or use of places of residence. It provides the last resort for difficult disputes between neighbours. Present to them whatever evidence you have to justify your case. On 13th March 2015, an Act (i.e. COMMUNITY DISPUTES RESOLUTION ACT 2015) to facilitate the resolution of community disputes was passed by Parliament and assented to by the President on 21st April 2015. 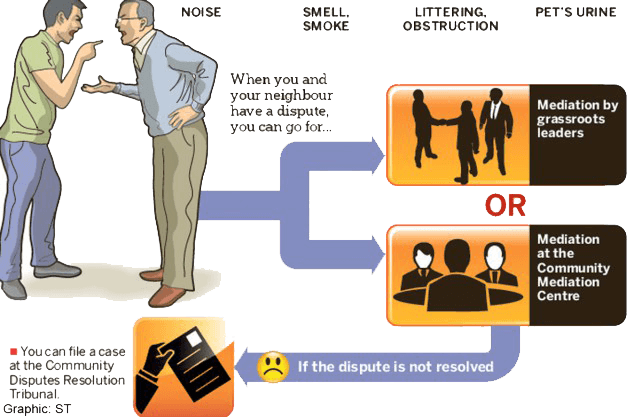 The Act provide a statutory tort for community disputes and establishes the Community Disputes Resolution Tribunals (CDRT) as part of the State Courts to hear cases involving intractable disputes between neighbors, after all efforts including community mediation have exhausted. The CDRTs are specialized courts that will only hear claims between neighbors over issues related to the enjoyment or use of places of residences.